Scientists have created an artificial material that mimics the tough, stretchy properties of muscle. 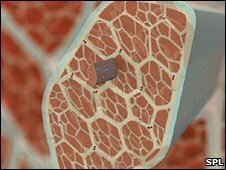 The material could find a potential application as a "scaffold" to aid muscle regeneration. The work, by a US-Canadian team of researchers, is reported in the latest issue of the journal Nature. "A hallmark of titin-like proteins is that they unfold under a stretching force to dissipate energy and prevent damage to tissues by over-stretching," said co-author John Gosline from the University of British Columbia in Canada. "We've been able to replicate one of the more unique characteristics exhibited by muscle tissues, but not all of them." Scientists cross-linked the polymers to form a solid, rubber-like material. But scientists will have to test whether the material is compatibile with human tissue.